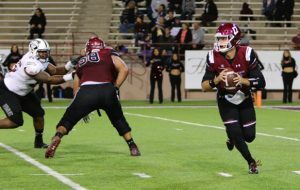 Optimism was in the brisk, fall air at Aggie Memorial Stadium in Las Cruces Saturday evening as the stage was set for a pivotal late-October matchup between the New Mexico State Aggies and the Arkansas State Red Wolves. The home crowd began pouring in after a day of homecoming festivities. A win for the Aggies would mark their highest win total since the 2011 season while a win for the Red Wolves would move them into first place in the Sun Belt. It was the team’s first home game in over a month. The Aggies’ three-game road trip included losses against two very good football programs in Appalachian State (5-3, 4-0) and Arkansas (3-5, 1-4) before a fourth-quarter comeback to defeat Georgia Southern (0-7, 0-3). The Aggies faced a very high-powered team in the Red Wolves who came in 19-1 in conference play since 2014. NMSU Head Coach Doug Martin mentioned earlier in the week that his team was going to penetrate the Red Wolves’ defense with a heavy rushing attack in Larry Rose III and Jason Huntley. Arkansas State’s defense came into the game allowing 202.8 yards rushing per game. After earning just 35 yards on 21 plays in the first quarter, New Mexico State looked to rebound in the second. Just over four minutes in, defensive end Malik Demby knocked the ball loose from Arkansas State quarterback Justice Hansen and defensive tackle Roy Lopez recovered at the Arkansas State 24 yard line. Larry Rose pounded his way into the end zone on five straight rushes, and an extra point evened the game at seven. With 1:11 remaining in the first half, quarterback Tyler Rogers looked in command of his offense, driving 84 yards down the field for a score. Rogers spread the ball around, finding five different receivers for 84 yards. Tight End Bryce Roberts caught a three-yard pass in the end-zone, putting the Aggies ahead 14-7 at the half. Arkansas State amassed just one yard less in total offense than the Aggies, did not convert a third down and had 12 penalties for 105 yards in the first half. The third quarter belonged to the Red Wolves as they scored 10 unanswered points on a 44 yard field goal off the boot of Sawyer Williams, and a 23 yard touchdown strike from Hansen to Bayless. Arkansas State remained in the lead until Tyler Rogers dove across the goal line for six to put his team back on top 21-17 on the first play of the fourth quarter. In the fourth, the Aggies’ offensive line was picked apart and fatigue began to set in after continuous turnovers. Things got ugly as the crowd vanished faster than New Mexico State’s lead. Arkansas State scored 20 unanswered points against a worn down defense that was haunted by poor field position and far too many plays. The final score was 37–21 as the Aggies dropped to 3-5 on the season and the Red Wolves improved to 5-2 to remain undefeated this season in conference play. “Tonight was disappointing. Our offensive line got totally man-handled and couldn’t protect the passer. [Rogers] had no time to throw the ball and we really didn’t run the ball effectively. We just really got whipped up front on the offensive line,” Coach Martin said. The game was very different than what many were expecting from two of the top three offenses in the Sun Belt. Justice Hansen outshined Tyler Rogers, throwing for over 60 percent, 297 yards and four touchdowns. Rogers was 50 percent for 221 yards and only one touchdown on the night. Despite allowing 37 points, New Mexico State’s defense held the number one ranked offense in the Sun Belt to just 3 of 14 third-down conversions, made five sacks and forced two turnovers. The Red Wolves played even better, holding the Aggies to three third-down conversions of their own and 256 total yards, which is more than 200 yards below the Aggies’ season average. Rogers, who had little time to throw all night long, was sacked seven times. “I felt like we didn’t help out the defense as much as we should have,” Larry Rose III said, when asked of the defense’s performance. Rose III rushed for 58 yards on 18 carries. Linebacker Dalton Herrington, who played his heart out all game long, had a very different view of his side’s effort and stressed the importance of playing effectively for four quarters. Harrington finished the evening with 16 tackles, two sacks, three tackles for loss and a pass deflection. The Aggies will look to boost their 1-3 conference record when they take on the Texas State Bobcats Nov. 4 in San Marcos. New Mexico State will have to play much better as a team if they hope to eclipse four wins for the first time under Coach Martin. 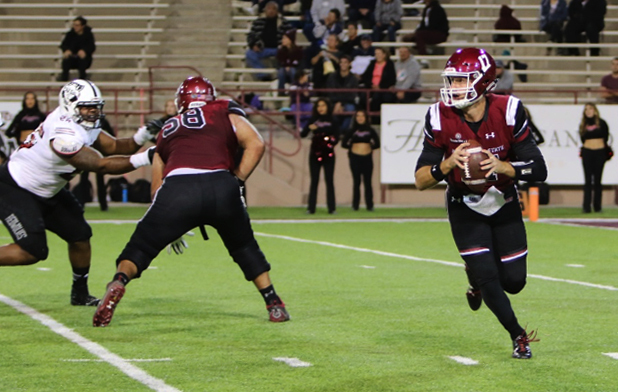 Last season, the Aggies defeated the Bobcats 50-10 at home.